The Leave-a-message or LAM function is an effective way of establishing two-way communication with your callers. With the Leave-a-message function the caller can leave a question or comment in audio form on your Freedom Fone system. Audio messages enable your callers to express themselves more freely and Freedom Fone captures those messages without loss of meaning or character. The content left by your callers can be played and listened to from the Freedom Fone interface. In addition to being a platform for leaving questions, the Leave-a-message function can be useful as an alert platform for callers to alert you on issues that need your attention. Content left by callers can also be re-used, for example you could select 5 stories submitted for a competition using LAM, re-broadcast these and allow the public to vote for their favourites. 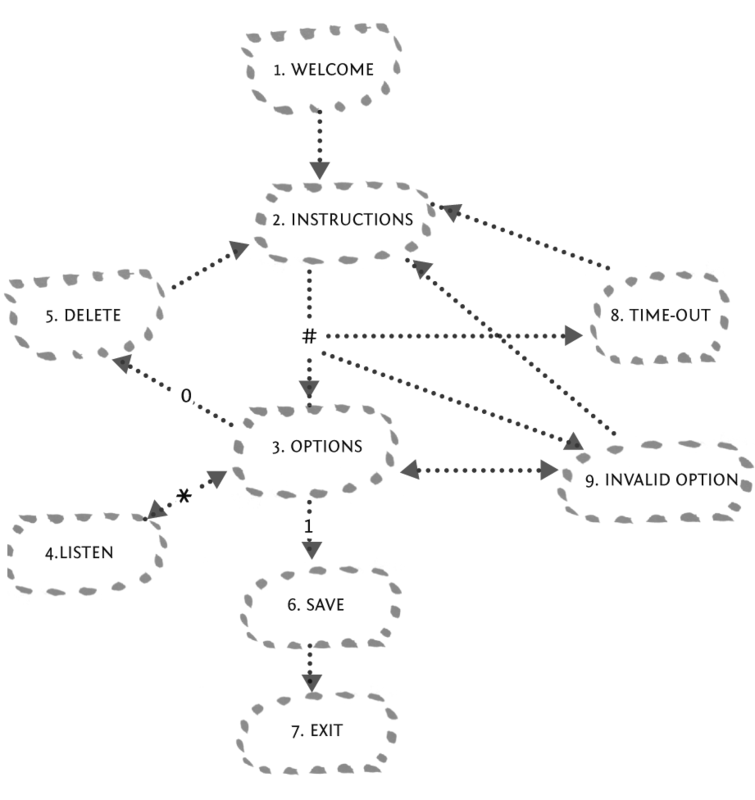 A Leave-a-message function can be either a part of a Voice Menu or it can be a stand alone service. As part of a voice menu the Leave-a-message function will be allocated a digit by the Freedom Fone administrator, which a caller can dial to access it. When the Leave-a-message is set up as a stand alone service, the caller will be directly connected to the service without dialing any key and they can record a message after hearing a beep and then hang up. By using the buttons # (hash), * (star), 0 (zero) and 1 (one), the user is able to navigate through the menu according to the illustration above. The caller's selection after leaving a audio message determines whether the simple or advanced functionality is used by the system. If they hang up directly after leaving a audio message, the message is saved; if they press the # key after leaving their audio message, the system will await further key selections to determine what should be done with the audio message. If they fail to select 1 to save their message before hanging up (having pressed #), their audio message will be deleted. 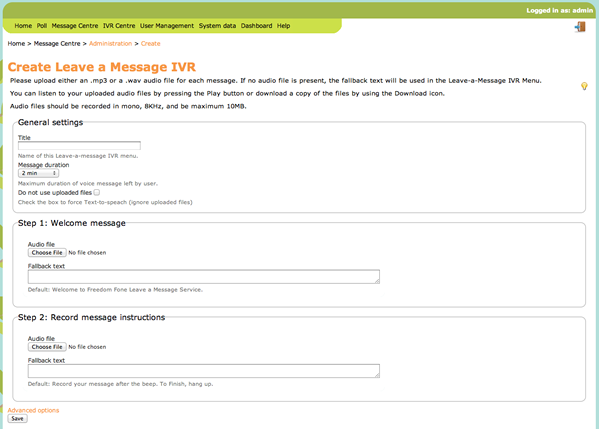 Callers’ audio messages are displayed in the Leave-a-message Inbox. Visiting Message Centre > Inboxes > Audio Messages will provide you with access to all of the Audio Messages left in the Leave-a-message inbox. Callers’ audio messages can be titled, tagged, categorised and rated. They can also be archived if required – in message edit view the status field can be used for this purpose. Each audio message can be exported as an .mp3 file using the download icon . Message Centre > Manage LAM and click on the Create New button. Instructions: The instructions file specifies the instructions the caller has to execute to review their message. Invalid: The invalid-sound attribute specifies the message that is played when a caller makes an invalid entry. Goodbye: The Goodbye message is played when a caller makes too many invalid entries or too many timeouts occur. This file is played before disconnecting the caller. Saving this will create your Leave-a-message which can now be linked to from your Voice Menus.